I then tried to discover who "R.F.J" was who sent the card. 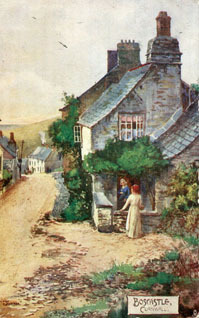 The postcard was sent in September 1905. Was the sender older or younger than the recipient ? My guess is that he was younger or he would have perhaps approached Jessie face to face rather than taking what must have been an unusual approach of asking her out ‘by post’. Jessie was born in 1888, so my guess is the sender was born after this. 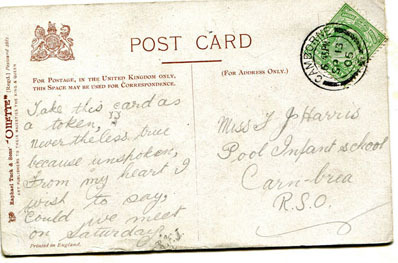 Assuming the sender was living in Cornwall, I have searched the 1901 and 1911 censuses and there is only one possible “R.F.J” but he was only 12 when the card was sent, so is probably too young to be our man. Of course the sender may have been visiting Cornwall or been down there temporarily. However extending the search country wide is like looking for a needle in a haystack. In order to bring everything together, I tried to find a living relative of Jessie's sister, Ada Harris. I sent messages to two individuals on Genes Reunited who are also listing their father, Frederick Harris who was born in St Erth in 1863 but, so far, have not had any response.